Jews light Hanukah candles for 8 nights, so it is only appropriate to have several Hanukah celebrations. It is actually important to mark all eight nights with a special Hanukah prayer and candle lighting- by adding one more candle each night until all eight are lit (actually, all nine, since the ninth is your ever present “helper candle”- “shamash”). (Giving kids small presents on each of the eight Hanukah nights is not mandatory, but we have done it when kids were younger). So on the first night of Hanukah, which came unusually early this year, (on a Wednesday before the Thanksgiving) we celebrated at home. Kids got the presents from parents and grandparents, I made traditional potato latkes, and then Den and I decided to bring the celebration up a notch and make the donut holes for the very first time. (Donuts are customary for Hanukah in many Jewish communities). Den found an apple cider recipe online and there was no going back. At first, it actually went well, as we followed directions, mixing the flour, sugar, and other dry ingredients. Then we reached a point that required an apple cider to be reduced, by constant stirring and boiling for… 45 minutes. This was a breaking point for Den who was now gone from the project, yet I was still feeling pretty confident…Until it was time to drop the donut balls into the hot oil and the balls were falling apart before they could even reach the pot. Oy Vay!!! Hanukah holiday is all about miracles and it happened for us that night, with a help of my super handy husband Vit. Vit is not Jewish, but often comes to our rescue (think candle making party at our temple). With some trial and error, Vit developed a “special” technique (which I am not sure I could repeat or even describe) – and somehow the donut (holes) turned out perfectly. Den declared them the best donuts of his life and asked us to make some more the next day. Well, the next day was the Thanksgiving, so maybe next year. On a fourth Hanukah night, which fell on a Saturday, my parents hosted their annual kids Hanukah party. This time it was the miracle of FAMILY. As in the prior years, the Hanukah gathering gives us all (and especially the kids) a wonderful opportunity to see the cousins we don’t get to see that often, all while celebrating our Jewish heritage. There are now certain elements of the evening that are well on the way to becoming a tradition “within” TRADITION. First, there is lighting of the candles on the wooden Menorah (made by my brother). 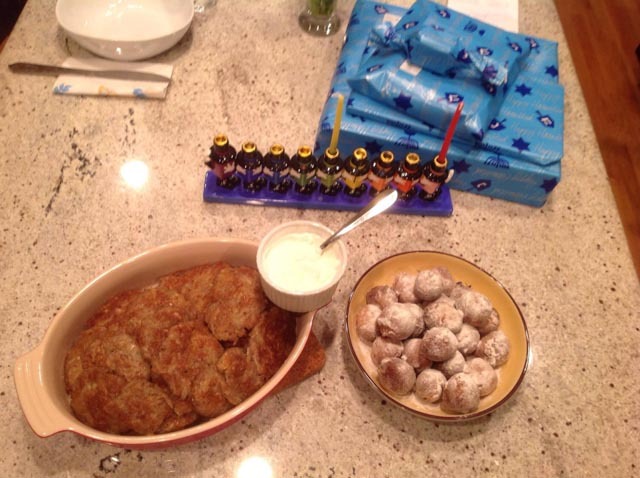 There is a Hanukah poem, written by my son Den and recited together with his cousin Mike; there are latkes, gifts and entertainment for the kids. This year we welcomed Cape-based DreamPuppets with creative puppets and storytelling. 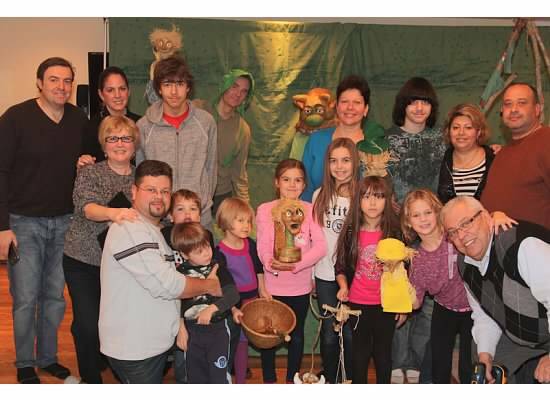 After the show, kids played with the puppets and cart-wheeled across the recreation room, while parents mingled and enjoyed delicious Russian-Jewish old country food. Everyone was grateful to the gracious hosts and we are all hoping to be back next year. We might have to bring back the last year’s Maccabi battle reenactment. 1 Comment to “Hanukah Miracles.